GPS IIIA is the first of three GPS III increments and is the foundation for enhancements in later blocks. New capabilities on GPS IIIA will provide improved position, navigation, and timing services to military and civil users by improving accuracy, integrity, and resistance to hostile jamming. Plans call for the modernized civil GPS signal (L1C) to be implemented on GPS III spacecraft. 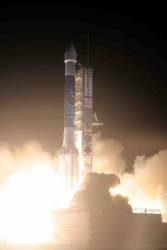 The Air Force will acquire eight GPS IIIA satellites in this competition and plans to begin launches in 2013. Teams led by Lockheed Martin and Boeing are leading contenders for the contract, estimated at $1.8 billion in value. Deadline for submitting proposals is August 27. Eight GPS IIIB and 16 GPS IIIC satellites are planned for later increments, with each increment including more capabilities based on technical maturity, according to the GPS Wing, part of the Space and Missile Systems Center at Los Angeles Air Force Base. The same vendor will probably also supply the later versions of satellites as well. When fully deployed, the GPS III constellation will enable a cross-link command and control architecture, allowing the entire GPS constellation to be updated from a single ground station instead of waiting for each satellite to orbit in view of a ground antenna. The satellites will also feature a new spot beam capability for enhanced M-Code coverage and increased resistance to hostile jamming.